I am so excited to offer a clean eating challenge beginning Monday, Jan. 7th! 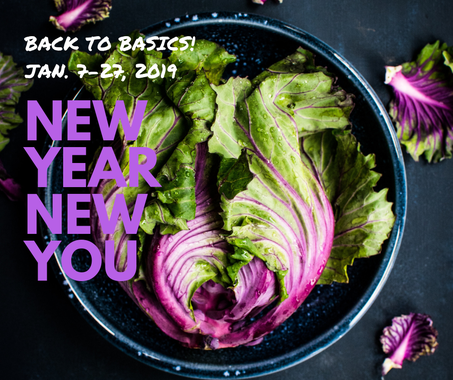 It is called the New Year New You, Back to Basics 21 Day Challenge! It is time to get back to the basics, where I started almost 4 years ago. This past year I have learned so much about food and have gotten quite restrictive in my personal eating which makes me very happy and full of energy. When I meal plan, my personal preferences play a part in how the meal plan comes together and I believe that my "restrictive tendencies" have made it hard for many to complete my challenges. The goal is to feel successful so I am letting my guard down and getting back to basics. The plan for this challenge is clean, healthy food that is delicious and simple to make but not so restrictive that you are left frustrated. The key to this is the quality of the food choices you make so you can be sure to hear a lot about how to find the best options. There are 2 food categories I have to stick to my guns on and those are artificial sugar and gluten. They are too inflammatory for us at anytime and I just can not promote them ever! The science is there to prove it. We simply should not eat them! I am incorporating a 5 day whole foods detox the first 5 days. This is always optional but I believe we all need a "cleanse" the first of the year after many indulgences. This is a beginner friendly detox, nothing crazy, actually we are going to double down and eliminate all inflammatory foods including all sugars, gluten, dairy, alcohol, red meat, and grains. We will focus on clean proteins and lots of vegetables and fruits. You can expect soups, salads, smoothies, and easy protein and veggie meals. We will also cut down on caffeine and for those of you who want the added challenge, to completely eliminate it during the 5 days. It is only fair to warn you that you most likely will feel a detox reaction, maybe a headache, low on energy, and most likely brain fog. These are detox reactions. Your body is purging the toxins that have been fueling you (like caffeine, gluten, and sugar). Ridding your body of these toxins is a huge load off of vital organs such as the liver and pancreas. Giving these organs a "rest" is key to optimal health! We will re-introduce small amounts of natural sugars, dairy, red meat, and grains back in on day 6. We will essentially slip into a more sustainable way of clean eating. Another part of the "back to basics" theme is exercise, daily movement. If you can nail down the food and exercise pieces of the health puzzle, you are over half way there! I am going to focus on food and movement this challenge, simple and direct! Eat clean and MOVE! If you have enjoyed my educational videos about nutritional foundations please know I will make them all viewable on my YouTube page so you can re-watch them or watch them for the first time. My passion is teaching so new videos in 2019 will be coming! There will be a 1 Day SPECIAL SALE for those on my email list only on Wednesday, Dec. 12th! *To get access to the 1 Day SALE you must be on my email list. I will be emailing a special link to my email list on Tuesday, Dec. 11th. Thursday, Dec. 13th the price will be set at $40. That is $1.90/day! You will receive recipes for breakfast, lunch, dinner, and a snack each day. Saturday dinners are labeled your FREE meal of the week. You also receive a detailed grocery list for each week of the challenge, motivational emails, and a private FB group to post photos, ask questions, and a place for me to ask questions and post workout videos. There will be a daily workout challenge, all fun stuff you can do at home with zero equipment. This will most likely be my last 21 day challenge for quite some time. I have a new business model in mind that I plan to roll out in early 2019 and I think you will like it even better then what I have been doing for 4 years! I am excited for 2019 and what all is holds. I sure hope you come along with me!